Why should I care about Google creating an IM network? I find that I much more productive at the computer when I can keep my hands on the keyboard and avoid using the mouse/trackpad. So, I curse any interface that requires me to use the mouse. Sometimes, audibly. So in the interest of keeping my hands on the keyboard and, simultaneously getting my email more organized, I downloaded and installed Mail Act-on and Mail Tags today. Mail Act-on is awesome! It essentially lets me set up little keyboard shortcuts to activate Mail rules. I’m really glad they chose to reuse Mail.app’s rules, rather than trying to redo that part themselves. Anyway, the interface is pretty useable and not tough to get started on. You can activate the rules either by hitting a special character (default: `) then then character for your rule, or you can activate the rule directly by hitting Ctrl-$foo where $foo is the character for your rule (if this is confusing, I think actually trying the extension will make things clearer). Mail Tags is a Mail.app extension that allows you to add some metadata to emails. 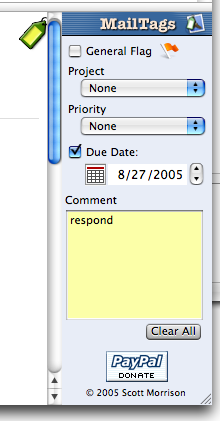 The available fields are Project, Priority, Due Date and Comment. My first reaction was to wish that they would have instead chosen to have less structure (like most tagging systems). The only field I’d actually like to be structured is the due date, but even that could be recreated in a plain tagging system (with something like due:2005-09-01, though that would make rule-writing more difficult). I have, of course, only used this stuff for a day, so I may be wrong about the previous thoughts. Of course, this metadata becomes very useful when you start creating Smart Mailboxes with it. I’ve now created a Smart Mailbox for each project I work on and for what I need to do about the email (action, response, wait). My scheme is loosely based on GTD and will probably become more strongly based on that as time goes on. Both of these extensions are über-kewl, but are infinitely more useful when used together. Mail-tags lets me keep organized without being entirely constrained to a rigid hierarchical structure. Mail Act-on lets me keep my hands on the keyboard. And, for that, I’m grateful. There is one little thing that displeases me about these plugins, though. When I create Act-on rules to manipulate the MailTags comment, I can only set the comment- I can’t append to it. I think I can get around that for now, but it seems like an awfully useful thing to have. * I know the real answer to my non-mouse using desire is to switch to Emacs. Switching to Emacs is probably inevitable for me, but not yet. So, today is the last day of my internship with Technorati. I can’t believe how much has happened, how many people I’ve met and how much cool stuff I’ve gotten to work on in such a sort period of time. I’ve learned a lot about developing software, running a business and how those two things interact. I start school again tomorrow at USF and am really looking forward to the classes I’m taking this fall. Thankfully, though, I’ve arranged to stay at Technorati part-time while in school. That’s right- I’m still going to be working at Technorati while in school! I’ll get to learn even more about balancing multiple ongoing projects (time to go re-read GTD). Thank you to everyone at Technorati for giving me this opportunity. I’m sitting at home now (even though the camp is still going on) trying to recover a bit from barcamp. Its tough to believe that we really threw this together in a week. Chris, Andy, Eris, Ross (and others)- awesome job. Christopher Walken is (reportedly) running for president in 2008. Great! 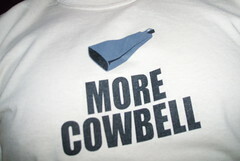 Our nation needs more cowbell. Posted in General | Comments Off on More Cowbell, baby! You are currently browsing the the ryan king weblog archives for August, 2005.